Well, poo. 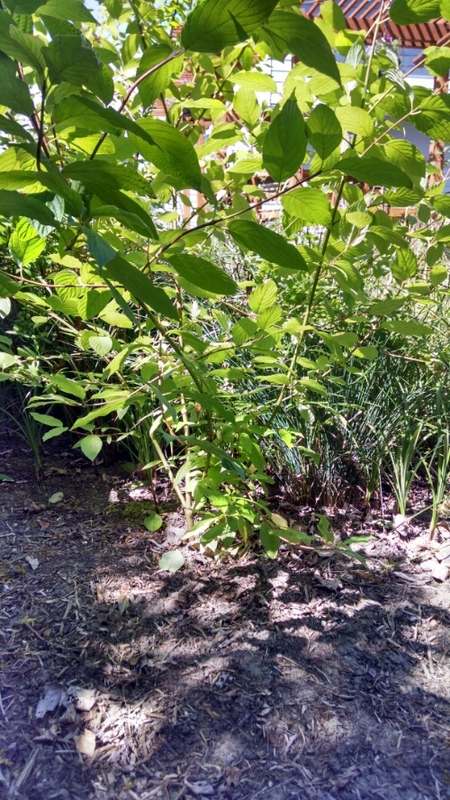 I just wrote a long, elaborate post about the rain garden and it got deleted by accident. That stinks. 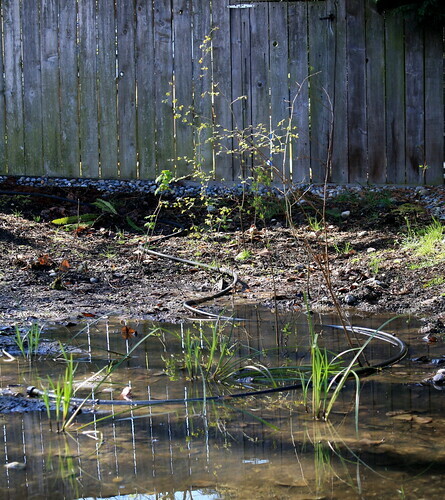 As I was saying… Our rain garden is now in its fourth summer, a season it doesn’t like much. 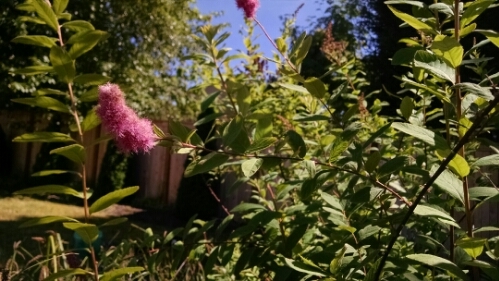 Summer is hot, dry, and sunny, all things not much beloved of native Washington plants. 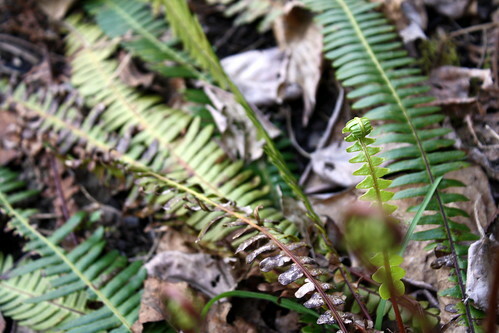 Many of the ferns suffer quite a bit, barely surviving. They need more cool shade, being understory plants. 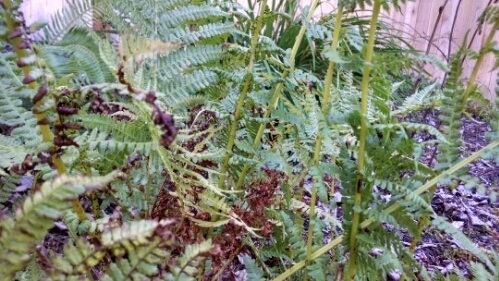 Ferns suffering from too much sunny, dry weather. 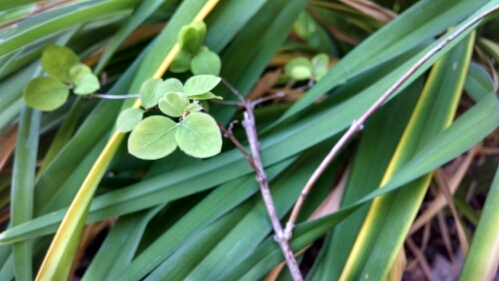 The below is the last little leafy twig on a much larger, mostly dead plant that got cooked last summer, and is also prey to predation by bunnies. However, some things have worked out well enough. 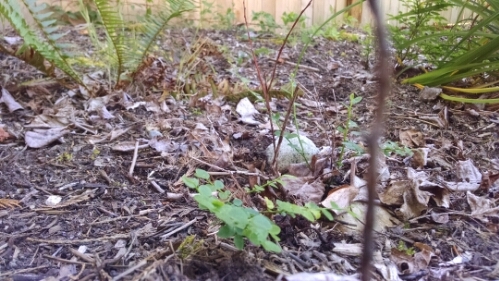 I planted huckleberries without much expectation of success – they die in captivity often – but one of the two I planted is doing decently well. 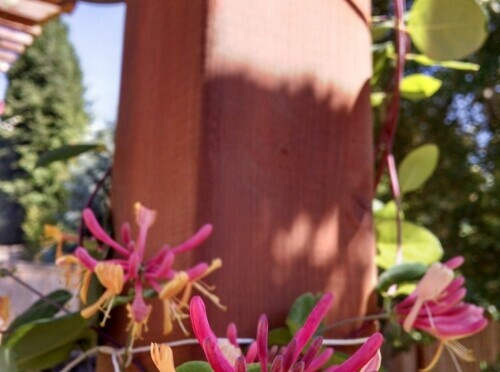 Huckleberries sheltering beneath day lilies. I don’t fight all incursions by all weeds; I evaluate and decide whether to let it stay or not. This has really worked out in the grasses department, where all those grasses, sedges, and reeds I put in coexist with wild ones. Aso doing well are the dogwood I planted and a tall, woody, purple-flowering thing that I planted and now don’t know what it is. Anyone who has identification ideas, let me know. Those have both leafed out and provide lovely shade. Looking out from inside the rain garden towards the house. Rain garden shade, from inside the garden. 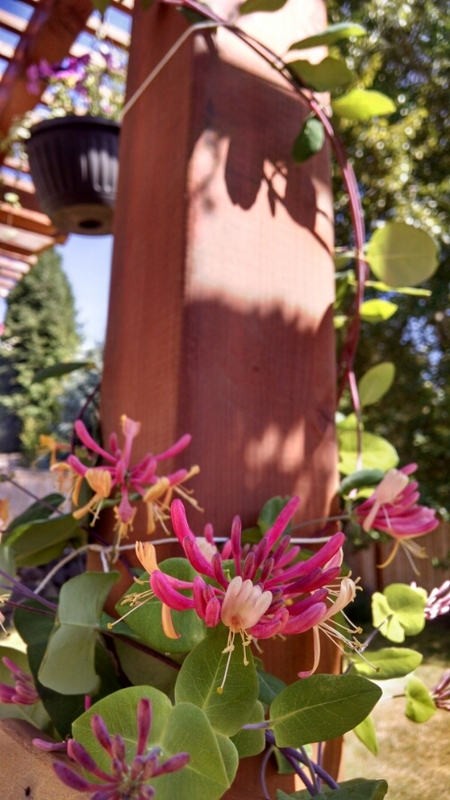 Oh, and in the category of plants doing great in this weather, but that aren’t in the rain garden: the honeysuckle. 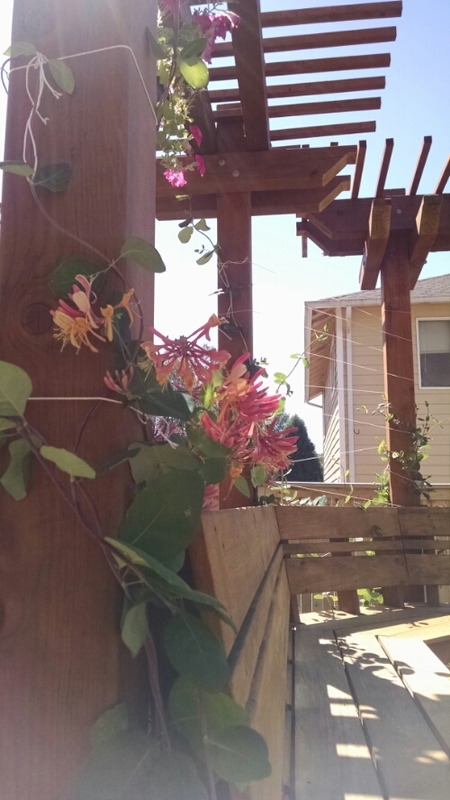 It’s grown from zero to nicely climbing this season, and even has some new flowers. Also, the avocado tree, which has grown at an alarming rate since I put out on the front porch. I have to keep it short enough to bring inside in the winter, potentially a very real challenge given that it’s grown something like 18″ so far this season. 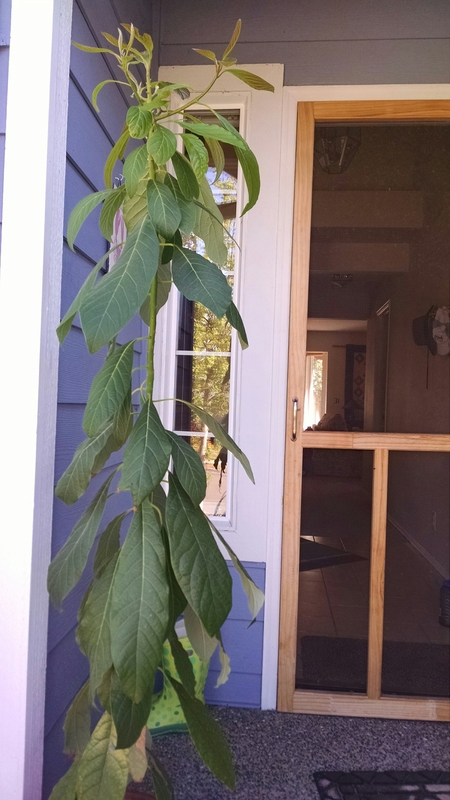 Five foot tall avocado tree, grown from a pit I planted when Benji was a newborn. Something is eating my avocado tree, but what is it? How do I stop it? 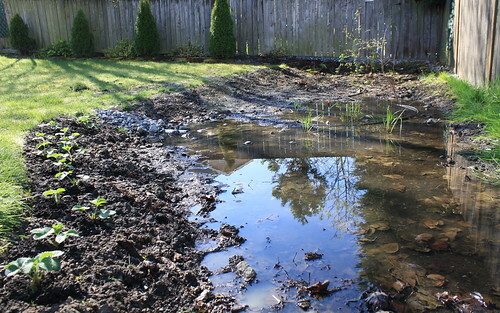 I don’t know if you recall my much-beloved rain garden; I may have mentioned it now and again… once or twice (or maybe three, four, or five, or, OK, a lot of times) before. 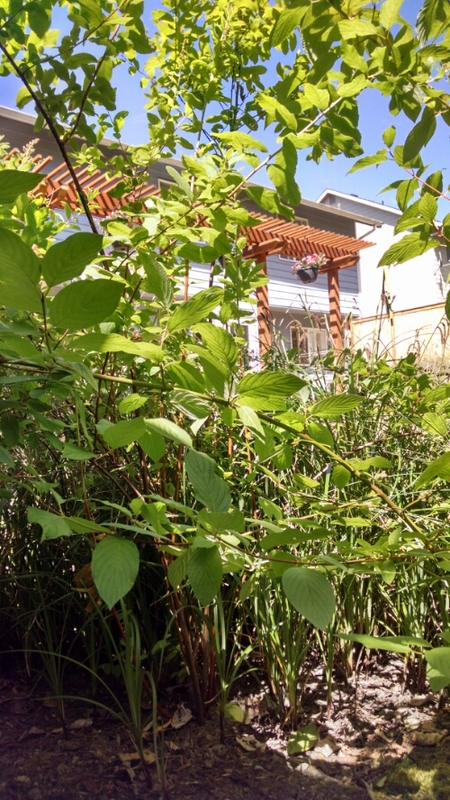 We did the hard work of building it back in 2011, but my rain garden care guide says it needs annual mulching to remain healthy. 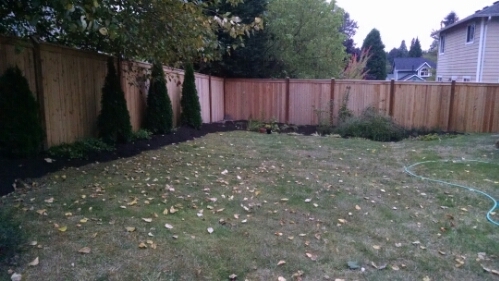 Needless to say, I haven’t mulched since we made it, and admittedly the amended soil has seemed to get harder and more clayey over time (clay being, alas, the composition of the rest of the yard). 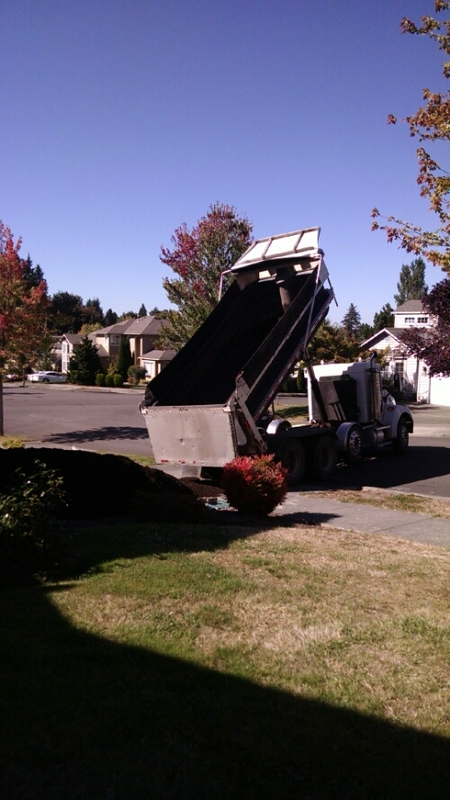 My first inkling of trouble came when the delivery dump truck dumped its entire load on our driveway. A dump truck visits our house, and Benji wasn't even here to enjoy it. 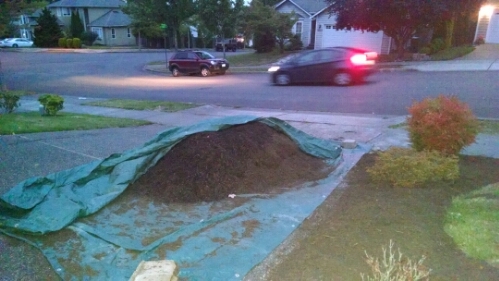 This is 6 cubic yards of mulch occupying our entire driveway. Note to future Katie: FOUR YARDS IS ENOUGH. Sunday, Ian and I moved mulch before church. Then, after church during Benji’s nap, Mom and Dad came over and helped me move more mulch while Ian did errands. 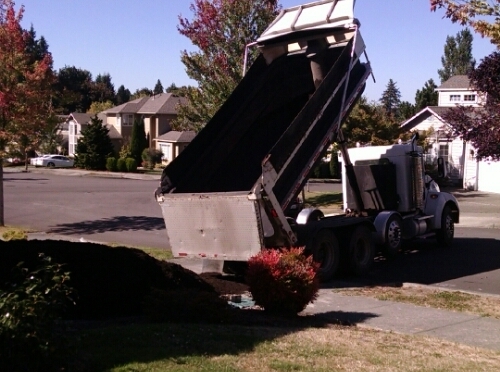 When Ian got home, he rested a bit, changed, and moved more mulch. I kept Benji occupied and out of the deeply alluring but regrettably prickly pile of dirt. Benji loved the idea of Ian being an excavator (piling dirt in the wheelbarrow), then a dump truck (pushing the wheelbarrow and dumping it), then a bulldozer (raking the mulch). Anyway, after all this diligent mulch moving, we’ve mulched just about every square foot in the yard that could possibly take it. Yet here we are. What's left after we mulched the yard to death. 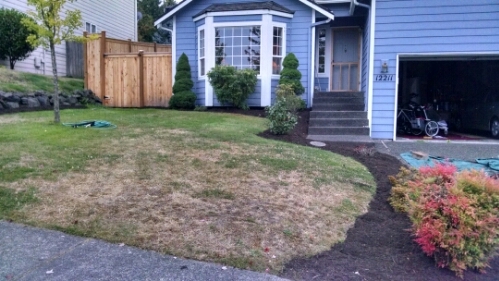 The back yard and rain garden, freshly mulched. 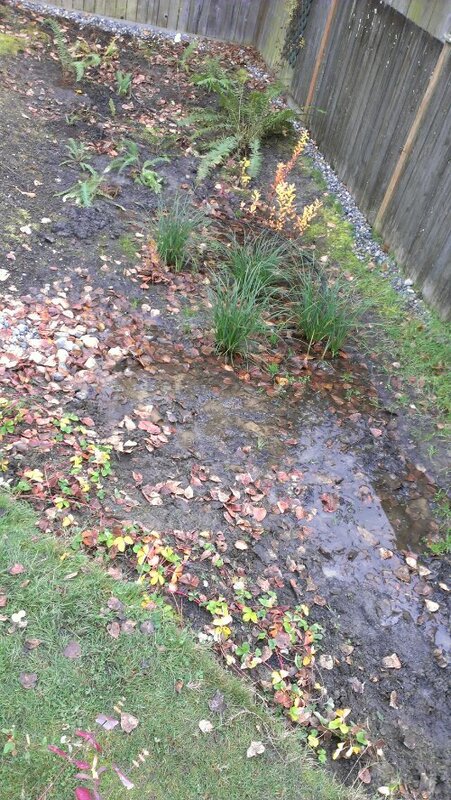 Mulching really shows where there are gaps in the rain garden. 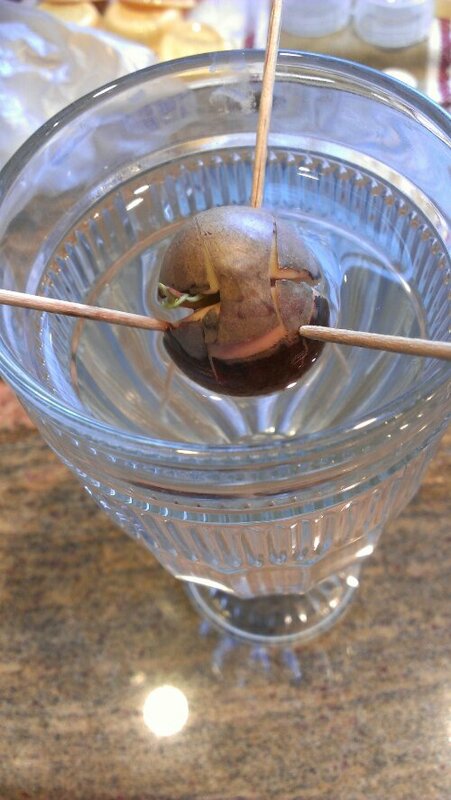 The avocado pit I “planted” shortly after Benji was born: Not only have two long roots emerged from the bottom, but a little shoot with a couple leaves delicately wrapped around it has begun pushing its way up through the top. So exciting! Remember how it felt as a kid, when you planted the bean and miraculously a sprout appeared a while later? Same feeling, only on a very slow time scale. 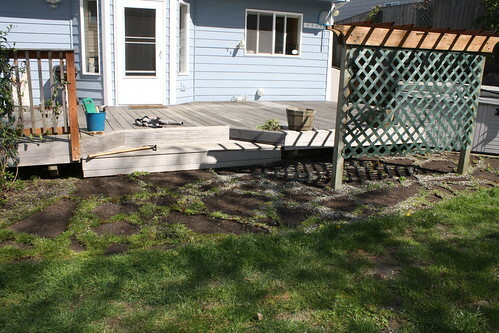 Our rain garden: Yesterday Deborah and I put the ferns in the ground. The big one didn’t look so large out in the woods. Just sayin’. I hope everything survives, but I’ve heard huckleberry bushes do not transplant well, so I won’t be surprised if those don’t make it. 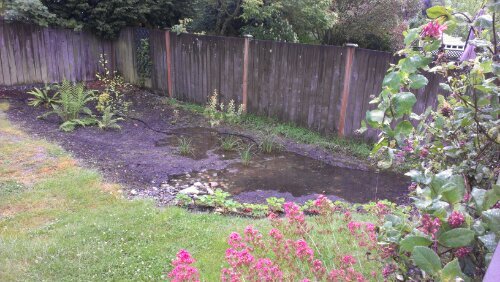 This really fills the garden in nicely; all I want is a few more reeds/grasses for the standing water area. Benji (pictured here sucking/chewing on Rudy the Rattling Reindeer): He’s woken up in the night with a little thought bubble containing a milk-ful bottle hovering over his head. 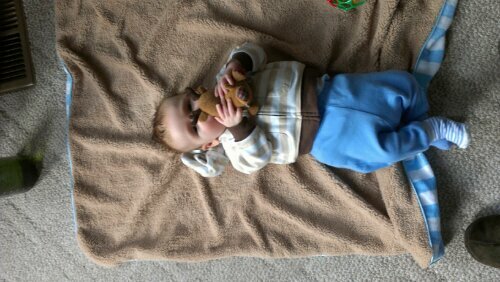 All he wants to do is eat and sleep, with just enough wakeful time to consume many ounces of food. Although the last 24 hours have been depressing for people, our rain garden (and other plants, for that matter) is loving it. 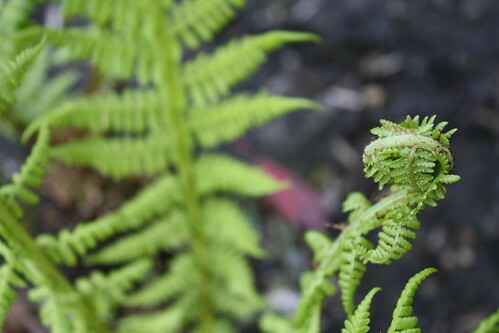 Look at how lush the ferns are! Having the rain garden helps me find the bright side even on rainy days. I continue to find the growth of our rain garden plants fascinating and thrilling. They seem to thrive despite my usual lack of plant mojo. 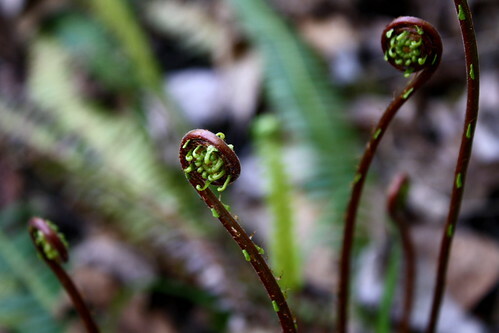 Today, while weeding the garden (grass keeps wanting to populate it; I can’t blame the grass, as that soil is super-nutritious and must be deeply appealing to plants) I thrilled to find that a couple of sword ferns I’d written off as goners had, unbeknownst to me, produced some fiddleheads. 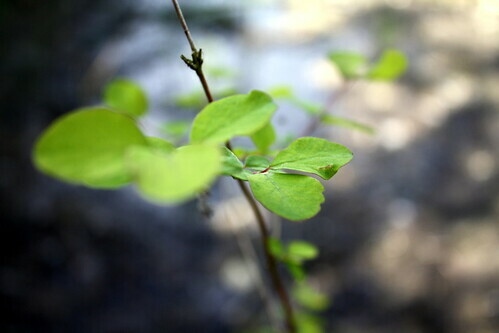 New growth! 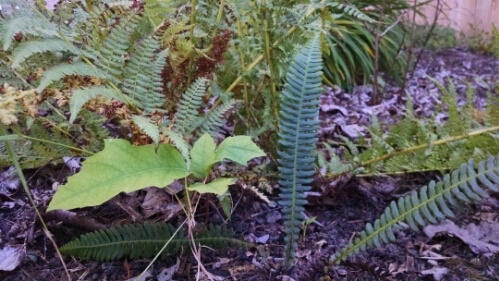 I think some kinds of ferns may die back in the winter, and then in the spring produce fresh growth from that unpromising pile of apparently dead leaves. If that isn’t a metaphor for Christian life, I don’t know what is. 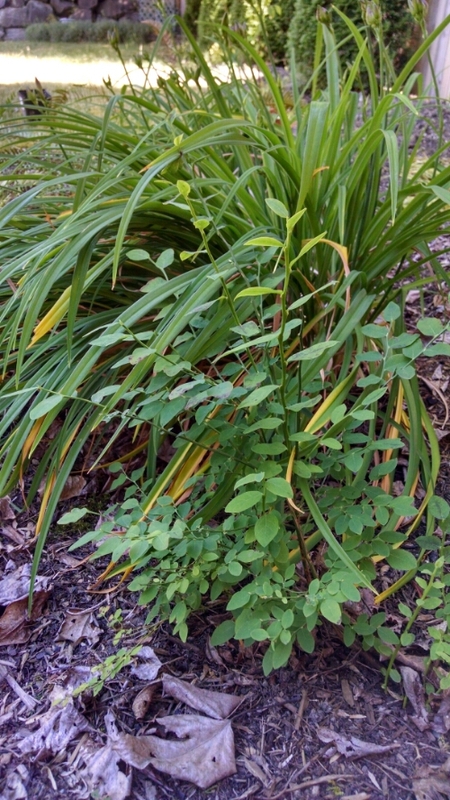 We also have this other plant, I don’t know what it is, that’s already as tall as I am and quite nicely greened out with small, fresh-looking little leaves. Since it looked like a bare twig when we planted it last November, that’s doing pretty darn well. I don’t know if this is premature, but I feel like I’ve seen more birds than usual in the back yard. 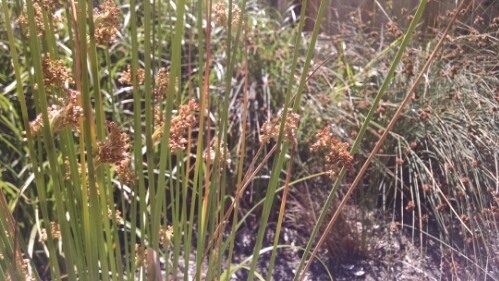 The rain garden, with its standing water, has certainly attracted more bugs — lots of insects lay their eggs there, and I see them flitting around. Haven’t noticed more mosquitoes than usual, but time will tell. But I wonder if the higher bug count, plus nice soft dirt, plus a ready source of water, draws more birds. The other day I saw a small, cute little bird taking a bath in the pond. 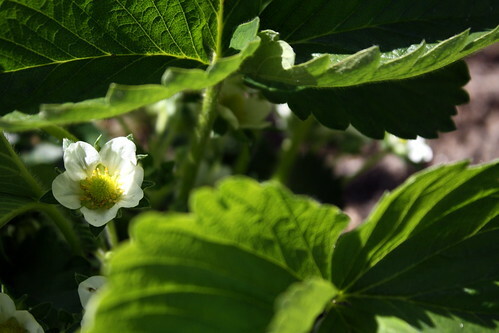 Not in the rain garden but still in the back yard, the strawberries I planted last year have lots and lots of flowers. I’m keenly anticipating the next couple months, when I hope to determine definitively whether a person can, in fact, subsist on strawberries alone. Finally, a farewell shot of Carmel rolling around in the back yard grass. 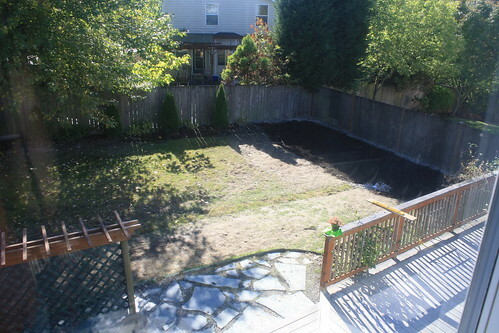 My parents’ back yard is in the midst of a massive landscaping project that has annihilated all the grass. Carmel is not allowed in the muddy morass, and instead has to be taken out to the front yard on a leash to do her business. So I’ve been bringing her over to our back yard and letting her just chill there, enjoying the life, sniffing the smells, hearing the sounds. I keep her well-supplied with ice water (it’s over 70° for the first time in well over a week, downright hot for around here) and she seems quite content. Today I had a physical therapy appointment and they did something new: Tape on my right shoulder. It didn’t really feel like it did anything while I was there, but then I rode home on my bike, and noticed — hey, wait a sec, this is more comfortable. I didn’t think my back was much of a problem on the bike lately, but wearing the tape made me realize it could actually feel better. That, however, is not the point of this post. The point is this. Here’s a picture of our back yard last September. Check out by the porch, all those green marble (?) slabs. 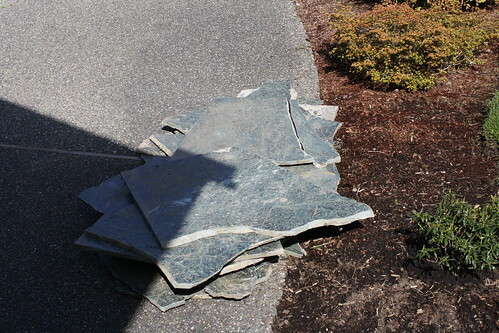 In short, I hauled all those green slabs from the back yard into the side of the driveway. They look like they came from a countertop. Then I weeded the interstices. The tape on my shoulder was noticeable there, too, in an “absence of shoulder pain” that I’d expect from that kind of activity. Pleasant surprise, there. As I pulled up some of the rocks, it reminded me of looking into an ant farm. Zillions of tiny black ants scrambling frantically everywhere as I uprooted and hauled away their seemingly-permanent roof. They had established tunnels clearly visible, and a few of them the rock came away with a bunch of their little eggs, and ants frantically trying to rescue them. I brushed the eggs and ants off, not wanting ants all over as I moved the slabs, but I doubt it did them a favor, as I probably squished most of them. It was hard not to get distracted by watching all the interesting invertebrate life crawling all over as I moved rocks. I love watching bugs (from a distance). 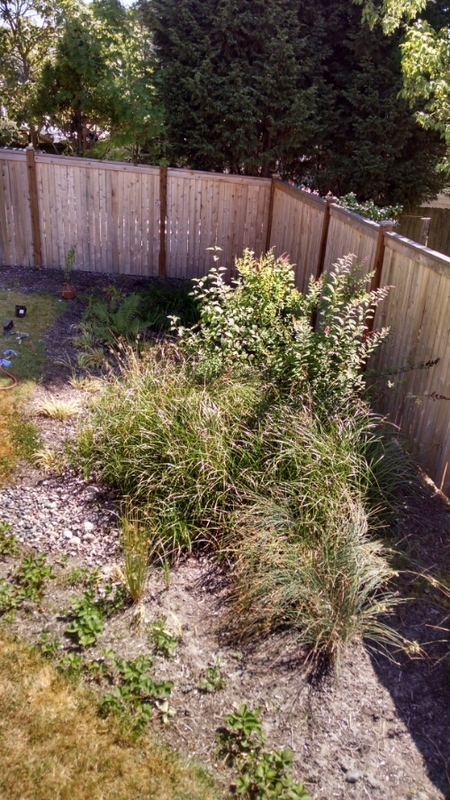 Since I had my camera outside anyway, here are a couple pictures of our rain garden as it looks today. See all the green?? I get excited every time I look out there. We did put a couple ferns in off in the back, but I don’t know that they’ll make it. They look pretty droopy. Yesterday it was had almost drained, but then we got a bunch of rain yesterday afternoon, and it filled up again. 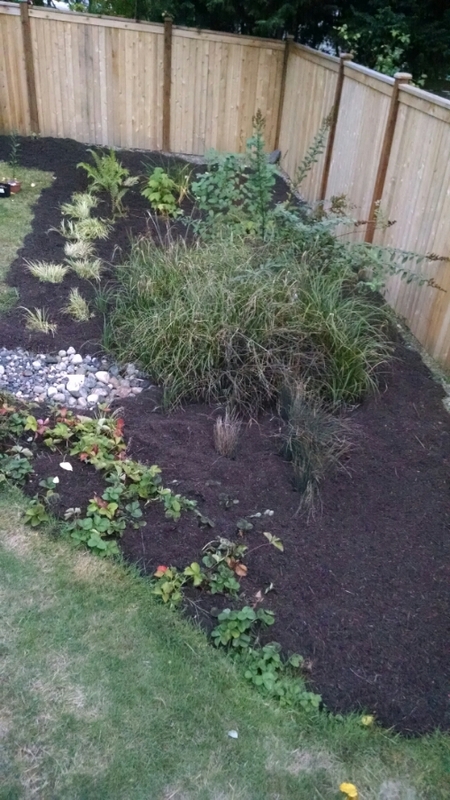 Notice the freshly-planted strawberries along the left side. That was yesterday’s project. I clipped the one flower already produced. I’m hoping that these buds will pop out soon. By the way, expect more talk about the yard for a little bit here. The weather’s more amenable to such work, and physically I’m not having trouble with this stuff yet. By July I may not be lifting heavy pieces of marble. Yesterday, another dry but slightly more overcast day, I planted 15 new strawberry plants as a ground cover for the edge of the rain garden. That accounts for a little more than half of the area needed to be covered. I figured we might as well plant something delicious, since we have to put something in. Hopefully that doesn’t backfire and cover our yard in strawberries… but I figure, there are worse things to have take over your yard. I also have some strawberries in a raised bed, and now I’m kind of wishing I’d put something else there. Maybe I should do some other food, like lettuces or something, along the remaining length of the rain garden. Hmm. 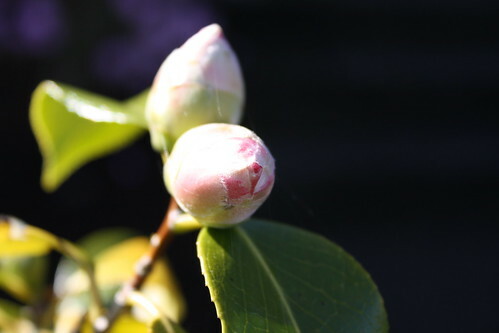 I also took some steps to revive the camellia we transplanted into the front yard last summer. 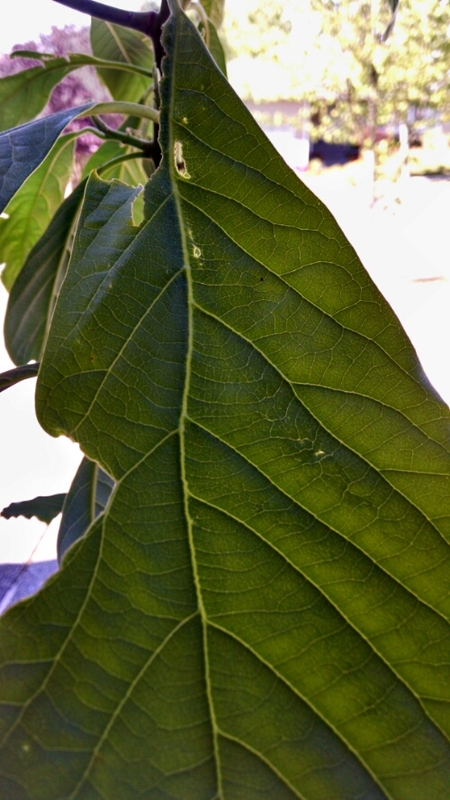 It’s got lots of flower buds, but ever since we planted it, the leaves have slowly been turning yellower. I thought perhaps it was shocked by the transplanting, so I waited over the winter to see if it improved; nope. 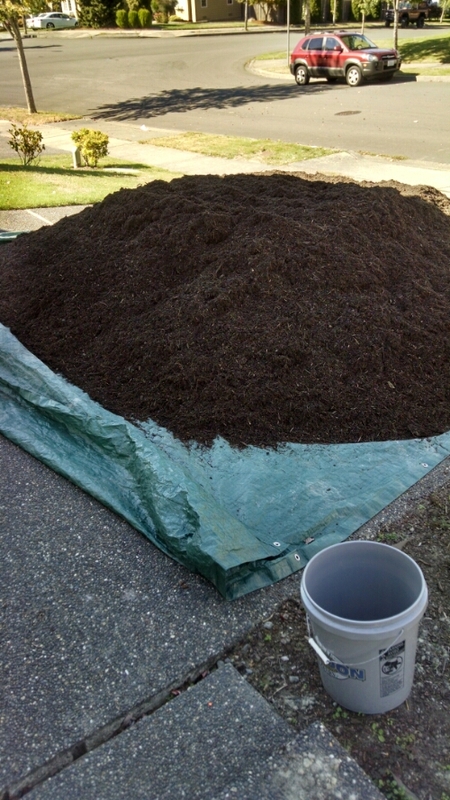 So I’m trying fertilizer and compost, per the expert Molbak’s advice. I don’t want it to die, because the flowers are pretty — a simple reason, I guess, but generally I’m bad with plants, and I rarely make an effort to rescue sick plants. It’s saying a lot that I put in any effort for this one. And, in our final plant-related news, the rain garden plants have started sprouting. I have to admit, it feels miraculous to me. We got them in late December as mere twigs — twigs in lots of dirt. Nary a spot of leafiness, even last season’s leaves still hanging on. But with hope, I planted them very carefully, according to rain garden-planting directions I have. The sedges started showing new growth first, but now almost everything (except the ferns, which I expect to die) have started showing small new leaves. I mean, yes, they still look like twigs, but they’re clearly living twigs, with the potential to become a lovely natural green space in suburbia. Of course, I still need to keep them alive through the summer. Despite the fact that I’m not good at gardening and have minimal interest in yard work (with the result that our yard looks mediocre at best), I still continue to try to improve it incrementally. Maybe in another 10 or 15 years we’ll have something I genuinely like to see when I look out the window.